Students go to schools and colleges to receive education and become good professionals as well as human being. There is a collaborative learning environment for many students devoid of trouble and bullying. Nonetheless, there is an impact of diversity in the classroom and has its own importance. The students often come from diverse backgrounds with various cultures which gives the classroom a heterogeneous environment. Imparting education in such a learning environment comes with its pros and cons. Let us also not forget about the factors that bring about the diversity in the classroom. Imparting education to them has its own positive and negative aspects. Learners of multifarious ethnicity and cultural background come together in a classroom of a school to get an education as well as to know about each other thoroughly. It is a fascinating opportunity to extend knowledge and obtain information about the cultural behavior of the class and know that they are equal. People become more tolerant as they learn to respect the difference of opinion. It is a great learning atmosphere especially for the students coming from different backgrounds. They are introduced to a completely new world. They are exposed to a world which has a broader horizon. Primarily the children might not accept their classmates who might be different in ethnicity or religion. This classroom compels them to sit with everyone and move over with their prejudices and inhibitions. Eventually, they become friends and accept them with their differences.They become mature with their power of acceptance and are less likely to suffer from tunnel vision syndrome later in their lives. Classroom activities often require students to work in teams or groups and, in order to successfully complete a task, students must overcome all differences and value their team. They are introduced to a completely new world that broadens their exposure. It is a huge experience especially for the students coming from homogeneous backgrounds. 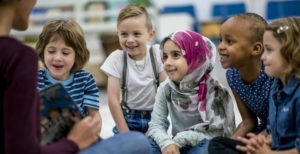 Teachers who support multicultural education avoid textbooks that focus mostly on a particular identity and instead go for textbooks and materials that are ideal for teaching numerous cultures and historical backgrounds. This approach creates students and professionals who are wise, inclusive, community-oriented and kind. An educator can then focus on an intellectual diversity in the classroom. One of the strongest positive effects of the diversified classroom is that along with friendship and acceptance, they learn to communicate and eventually start learning a new language without any compulsion. This is an added perk of literacy. This broadens their linguistic knowledge. The world has turned into a global village where people have to travel to various countries for their future prospects. This adds as a perk as studying with various students hailing from different countries is an experience to look forward to. They become more accommodative and compromising. To learn the history of a particular country is generally a part of the set of instructions, where students assemble from various countries. It might not go down well with the students of various cultures. There is also a religious diversity in the classroom. The students might not accept lectures on a particular religion. They might lose focus and interest as they cannot relate well enough. They may start losing their cultural identity. Children might get confused. One of the greatest problems that are faced by a diverse classroom is segregation. Students from the same culture tend to get closer and do not interact much with others. As a result, new groups formed hampering the process of collaborative learning is somewhere lost between new groups among learners. Students become group-oriented and less tolerant toward each other. This is injurious to a harmonious study environment. It becomes difficult for a teacher to give instructions to the students of various cultures and religions one particular subject based on one particular heritage. To top it, all children are not gifted with the same intelligence and academic interest. Teachers face challenges in imparting lessons to new students especially if they are conceptual or in linguistics. Also, students speaking different languages cannot understand a foreign language in a dynamic manner. Since every child is precious therefore individual support and strategy is chalked out to educate them. It is time-consuming and requires a lot of family time sacrifice. Sometimes learning difference may create stereotypical views in the minds of the teachers which transforms into prejudices over a period of time. It can spoil the learning process leading to poor results in the class. Teachers might get biased and support those who might be of his own culture. An all-inclusive education will definitely face challenges but in the end, its benefits cannot be overlooked. The management of such classrooms should focus on unity and support. Promoting respect for cultural diversity in the classroom is an inseparable part of education.